Master Tourney in Poznań – resume / New lists idea. On 17-18 November I took a part in a Master class tourney in Poznań, in Champions format. I want to shortly describe my games. First – the lists. I took: Calandra in SotN with all the infrantry goodies (2x bears, Raiders, Champs) and weird battlegroup (Blitzer (!) and Brawler). As a second list I took Doomie3 with MK, Mulg, Earthborn and Axer. We played 5 rounds and I won just one, but was close to win another (last one – see below), but I had a chance to face really experienced players and learn a lot. My opponent was Sikor. A really nice and calm guy – the game against him was a just a pure joy. He played Legion, so I knew I was going to see Anamag. And I did 🙂 I choose Callandra, because Anamag feat shut down my healing. The game was a slow grind through my melting forces. He wasn’t enough agressive with his Chosen, being afraid of 14” threat of ambushing Bears. If he was – the game could end with Chosen in Cally face, but in the end I managed to win on clock – Sikor lost a lot of time on dices under Star Crossed. 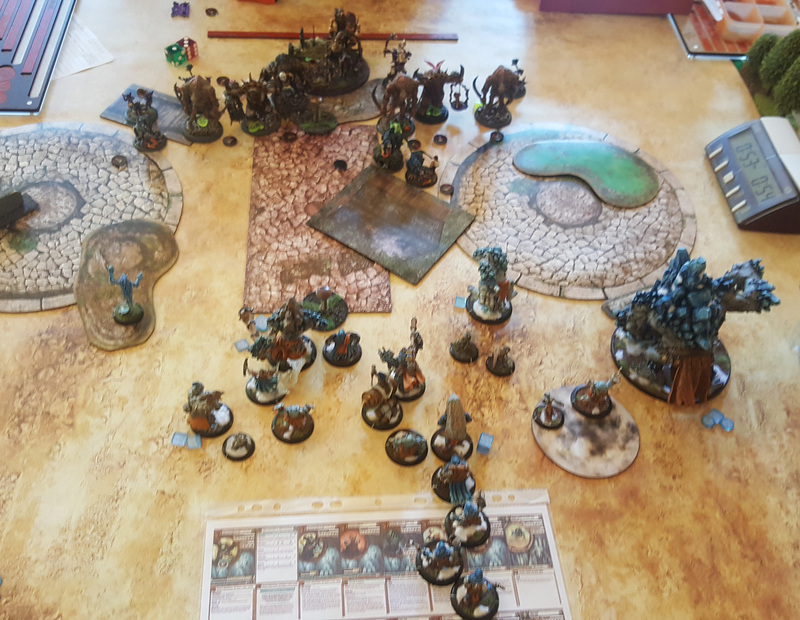 My opponent was Bartek „Vincus” and he played Grymkin. 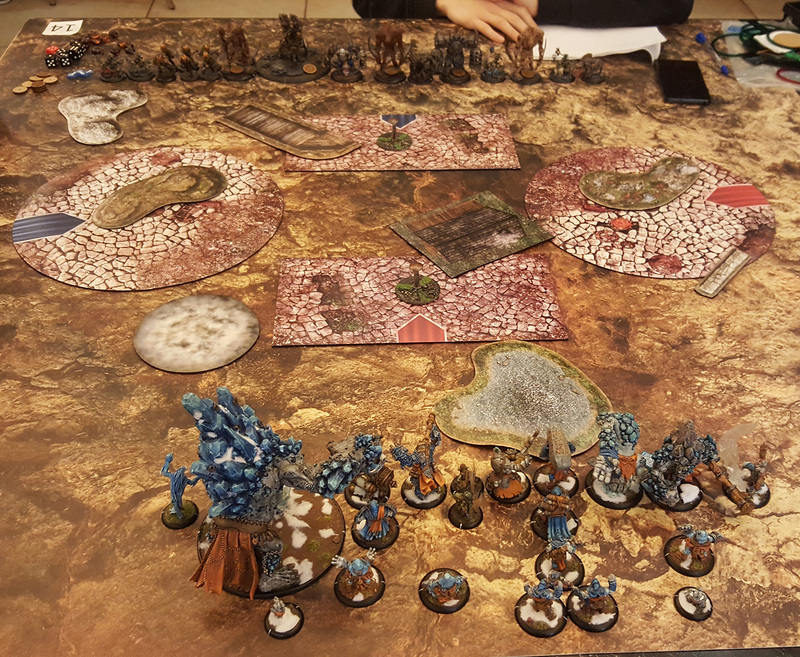 To be honest – it was my first game against Wicked Harvest, and I had this luck to face the best Grymkin player in Poland, member of the WTC team and a guy who regularly attend in many international events 🙂 On the bright side – he is really nice opponent and we had some fun / laught at the table. He had Old Witch and Child and picked Child. I went with Doomie. I managed to survive his alpha with my feat, but in the following turn I had not enough resources to retaliate. He outnumbers me with his hard hitting beast and threat ranges and finally Skin&Moans land on the Doomshaper, killing him. 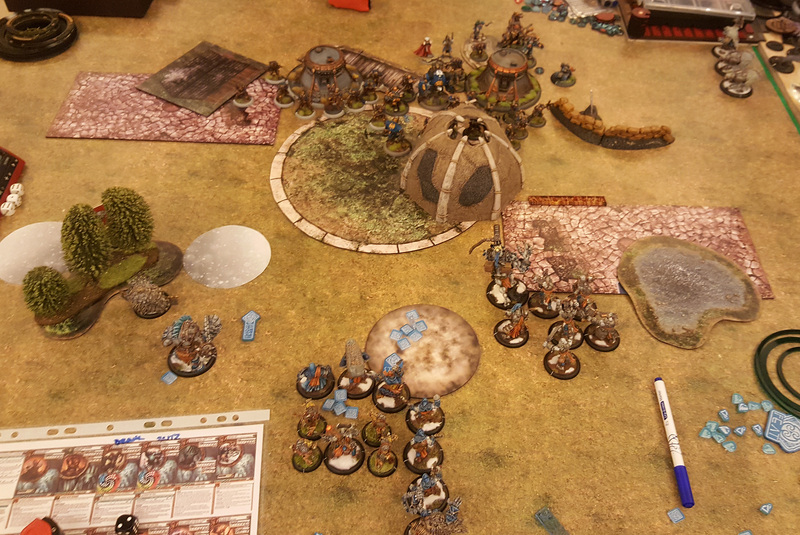 I came across Cygnar led by Marcin „Fryta” Nowicki – owner of Warroom.pl and WTC member/captain. He had Kraye and Siege2, and picked Siege in Trenchers theme with 2 Blockhouses. I picked Calandra. In his 1st turn Marcin shot of the table all my screen (Raiders) and slowly, turn by turn, gained more board with his forces, shooting accurately even under Star Crossed. In the end I killed only a few guys and one heavy jack and lost on scenario. 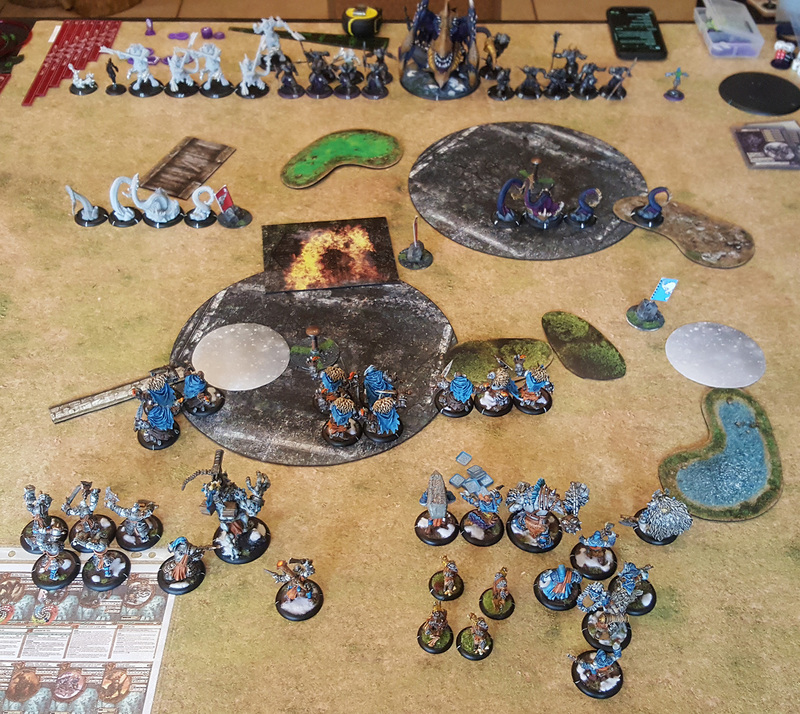 Another nice opponent – Yaro who had Retribution: Rahn and Elara. He choose Elara with a lot of jacks, some battlemages and mechanics. I threw Doomshaper at this. In key moment, one turn after my feat, I lost MK, Earthborn and Mulg. Yaro, despite the late hour, was nice enough to explain me my mistakes. Firstly – I choose wrong targets for MK, leaving him in range of 2 heavies instead of dealing with battle mages on the flank. Secondly – I committed Mulg where Earthborn was, and it wasn’t necessary at the time. All in all, I surrender when I had nothing but my caster and some support on the table. We shook hand and I went to sleep before final round next day. I was going to face Circle, but my opponent dropped and I was paired with Asia, and she had the same pair as Bartek in round 2. Asia took Child and I picked Doomie. This time I had some experience from previous round and wanted to play this better. Asia is a very nice lady, the only one girl in Poland who plays regularly at (almost?) every Master tourney. Unfortunately, right before the game one guy, who played his 5th round in the night and had nothing to do at the moment, sat at the side of our table and start to chat and interfere with our game. I had nothing against at the beginning, but that escalated and he not only talked, but even touched the models moving them 🙁 It ruined the game for me, and now I know I should tell him to go away. Distracted, I made a lot of stupid mistaked, but Asia did as well and at some point she even forgot to use Arcana. My biggest mistakes were: forgot to activate MK once (!) 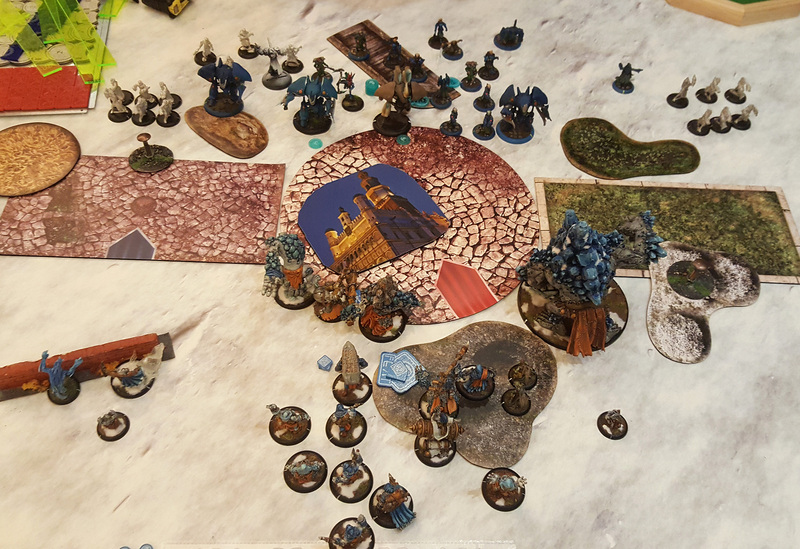 and in the key moment I wanted to move MK out of Death Knell aura to heal him with spawned Whelps (he was surrounded by Dread Rots, but MK have Bulldoze) and I didn’t do that, distracted by the guy again… Finally I lost by 1 pint in 7th round, but Asia had an easy CK too.